Found this flyer stuck in the back of my mailbox recently. Turns out my lack of thorough mailchecking made me miss this offer as it ran from February 7th to April 10th. 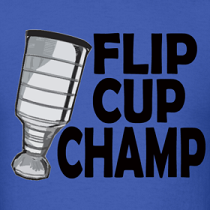 It sucked cause I really wanted a Mike Komisarek cup to sit in my cupboard and collect dust or my Phil Kessel cup to go missing for extended periods of time. Part of the fine print on the back should have included that the J.S Giguere cup is prone to cracks. The choices for these cups are just bizarre. Sure the Kris Versteeg trade was just bad luck, but J.S Giguere and Mike Komisarek? No cup for captain Dion Phaneuf? 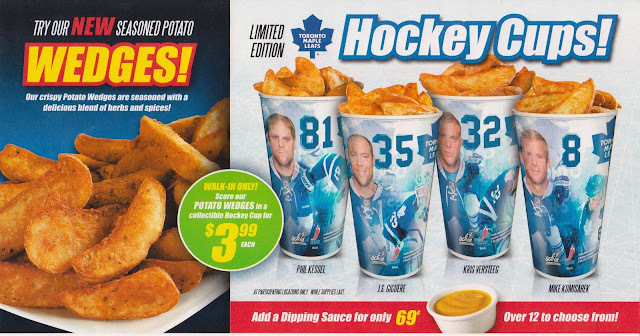 Or fan favourite Luke Schenn who would have increased Pizza Pizza sales by having his face on their cups (at least they didn't put Tyler Bozak on a cup for an easy sell to high school girls). Pizza Pizza could have also been really jerky and made their Dipping Sauce only 67 cents. They should have expanded the number of cups from 4 to 13 to match the actual number. That would also improve Joey Crabb's chances of getting his face on a cup! I didn't know pizza pizza had wedges. Will have to grab some on the way home from the bar instead of street meat. had them last night they were great! They couldn't find better players to be on these cups. I would have liked it more if it was just Marlies guys. Kadri, Colborne and Gardiner.